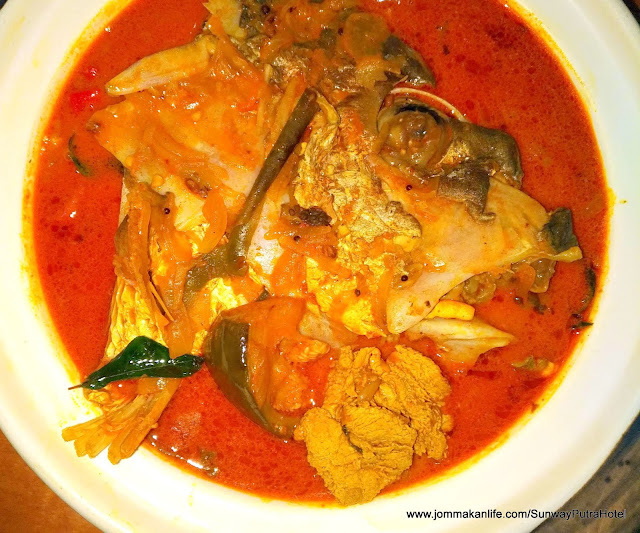 Deliciously hearty Fish Head Curry by Executive Chef Rossham Rusli of Sunway Putra Hotel KL heads the ‘must eat’ list when you visit the hotel. Served at the Coffee House daily from 11am to 1030pm, the house speciality is priced from RM39.90 nett per portion (ample to feed 2 persons, the price may vary according to size of the fish head). Served piping hot in a claypot, the fish head curry redolent with the enticing, heady scent of Indian spices is enough to make the mouth water. Marinated overnight in turmeric powder, salt and pepper, the red snapper fish head is then cooked with onion, shallots, garlic, curry powder and fresh tomatoes before tamarind, yoghurt, green cardamoms, cumin, green chillies, coriander seeds and mace are added. The thick, bright orange and deeply flavourful curry runneth over with such complex spice nuances that you'd be asking for more after the first taste. Sweet and fleshy, the fish is substantiated further by chunks of eggplant, okra and fish eggs.Two plates of white rice with cucumber raita, mango chutney and papadum crisps are included, making it a complete meal. The Coffee House even accords a complimentary bib with every fish head curry order. For every five portions purchased, diners will get the sixth serving free. Angel Hair Golden Pasta with Soft Shell Crab from the Coffee House a la carte menu is a surefire crowd-pleaser. I dread creamy pasta sauces but in this case, the zingy, punchy flavours rendered by bits of bird’s eye chilli, curry leaves and garlic in the lightly creamy sauce hit the spot. The al dente pasta won extra points as did the deep-fried hunk of soft shell crab and sliced garlic bread. Indian cuisine fans will find ample succour from Murg Butter Chicken, a delectable chicken dish cooked with tomatoes, spices, butter and cream. According to Bon Appétit magazine, this Delhi speciality was reputedly made using leftover tandoori chicken in the early 20th century. We love the lush creaminess with subtle fruity-tangy hints of tomatoes. So scrumptious when doused over white rice. From now until 31 December 2018, the Coffee House has a new A La Carte Deal going for only RM25 nett. One of the notable mains we’d recommend is Grilled Chicken Chop with Mashed Potato. Tender and juicy, the chicken fillet has an appetising charred smokiness to it; some veges and sauce complete the equation. Giving you more bang for your ringgit, a cup of coffee or tea and a slice of cake-of-the-day are included the superbly good value meal. Curry Noodles is another worthy contender. Spicy fare seems to be the forte of the Coffee House team and this piquant offering confirms that. Although the cockles were a tad tiny during our visit, the overall dish still had big appeal, thanks to its sublime gravy. 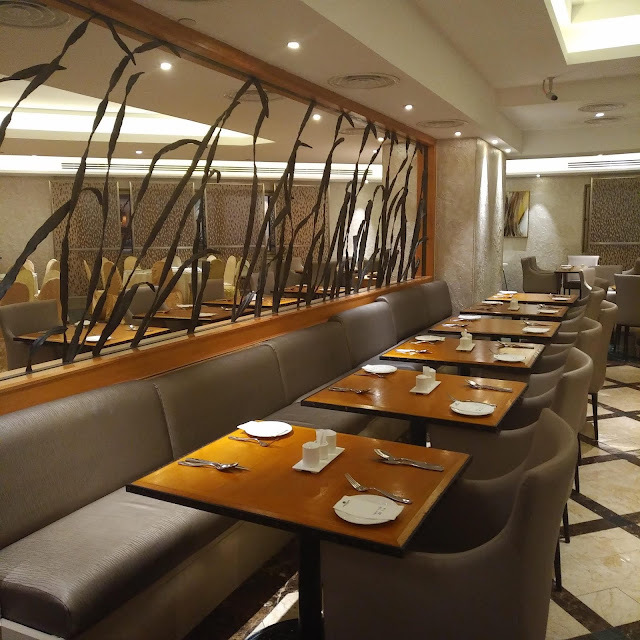 Those who prefer Asian fare will find viable choices such as Indonesian Fried Rice with Melinjo Crackers, Fish Tikka with Naan Bread and Vegetable Curry Tauhu with Jeera Pulou Rice up to their expectations. Parents with little ones in tow can enjoy their meal in peace as the Coffee House has a playroom to keep the youngsters occupied. Over at Gen Japanese Restaurant, Chef de Cuisine Mazwadie Mohamad holds court with a plethora of a la carte, teppanyaki and buffet temptations reflective of the Land of the Rising Sun. Prices are surprisingly affordable when it comes to the restaurant set meals. Our advice? Go for the superb value Teppanyaki Matsu (RM50 per person) comprising Zensai (special appetiser of the day), chef’s house salad, miso soup, a choice of teppan-cooked chicken or beef steak, fried rice, stir-fried Oriental vegetables and dessert (fresh fruits or green tea ice cream). Remember to inform the Gen team how you prefer your beef done…that delicious steak coupled with the panoramic city skyline view proves dining at Gen can be a romantic and enjoyable experience. 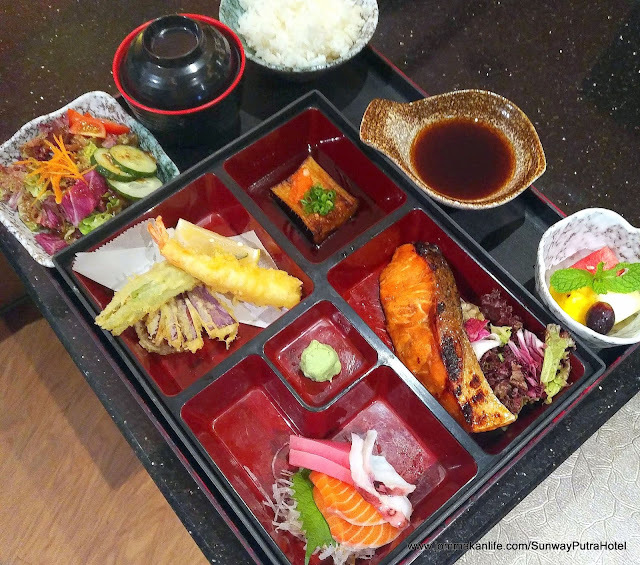 Fish lovers may prefer the box set of Grilled Salmon Bento (RM55). It’s literally a taste of Japan in one sitting as the different compartments proffer appetiser of the day, miso soup, three types of sashimi: tuna, salmon and squid, tempura seafood and vegetables, grilled salmon with teriyaki sauce, deep-fried eggplant, steamed white rice and green tea ice cream. Based on our experience, the entire meal passed muster. 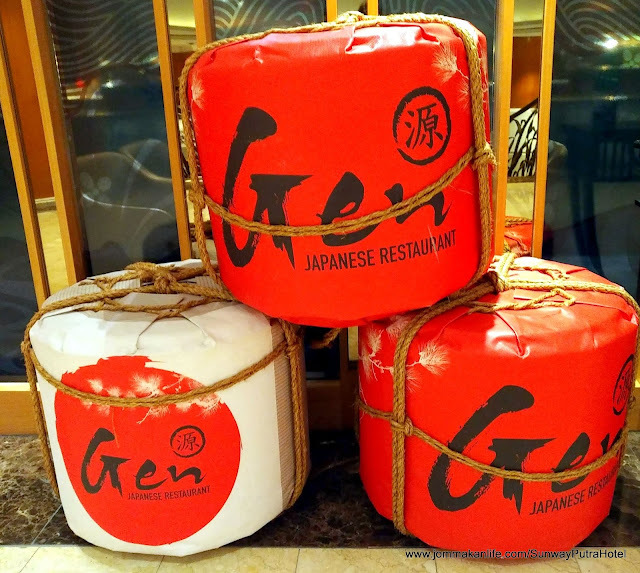 Sushi and hand rolls are equally popular at Gen. Personally I’d prefer less mayo topping for the Dragon Maki (RM39) but overall, the Salmon & Unagi Sushi should hit the spot for sushi fans in general. Crispy deep-fried Soft Shell Crab & Avocado slices combine to create the hand-rolled House Special California Temaki (RM28). 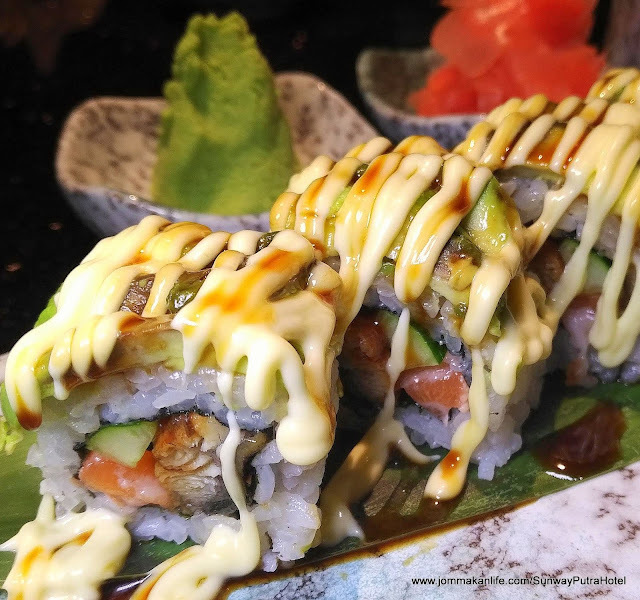 Resultant flavours appear subtler in this offering but the lashing of mayo and sweetish sauce atop the sushi roll should stand you in good stead. Girly chit-chat sessions are ideally spent over light savoury and sweet nibbles. 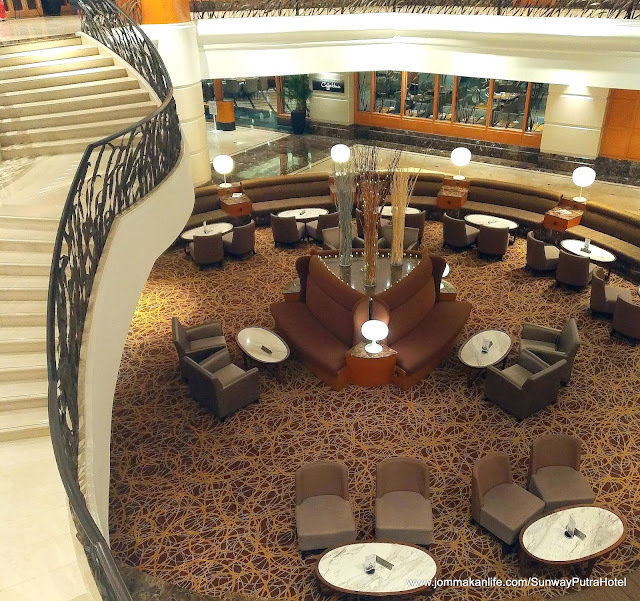 Set at the heart of Sunway Putra Hotel KL under its lovely glass dome atrium, guests can sit down to a choice of English or Malaysian Afternoon Tea (RM55 nett per set) at the Atrium Lounge. 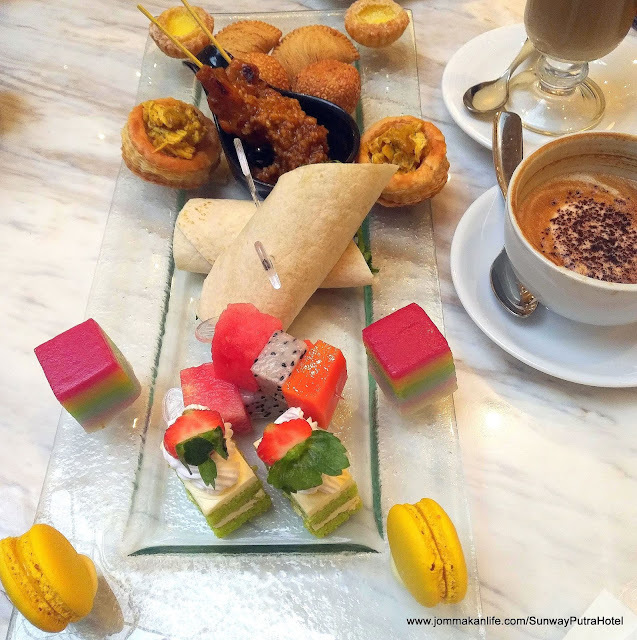 Lest you presume the lightweight selection too little, be assured the Malaysian Afternoon Tea platter shown here is plenty for two persons. Pastry Chef Rukedi Yajid's creations include Chicken Rendang French Puffs, Sardine Tortilla Wrap, Pandan Layer Cake, Potato Curry Puffs, Egg Tarts, Chicken Satay, Breaded Sesame Balls, Lime Macarons and Fresh Fruits. While tea is the beverage of choice to complement the dainty morsels, coffee drinkers need not fret as the hotel team will readily serve cappuccino and latte should that be of preference. It's relaxing to sit and fritter time away in the comfy lounge settees; a splendid setting to catch up with friends or loved ones.